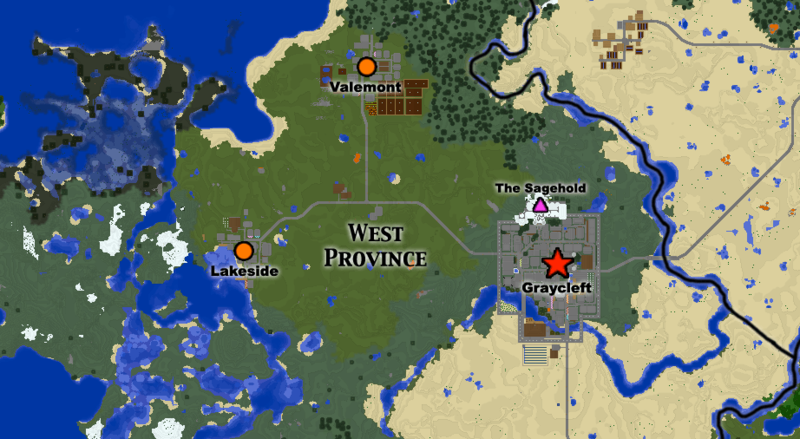 The West Province is one of my oldest locations, as Graycleft was the third location I built, and my first true city. Construction in Graycleft began in April 2012, and the two adjoining villages were built by December the same year. When the villages were built, Graycleft also grew with the addition of the Sagehold and the expansion of the surface portion of the city. The province has remained mostly untouched ever since, as I wanted it to keep its small, rural feel. As part of my 5th Anniversary Update for 2017, I’ve revisited the area and done some major improvements. Graycleft gained some fancy new city walls, had most of its surface buildings completely overhauled, and even got a new railway to The Deep. I also upgraded both villages to make the buildings a bit more modern. Lakeside got an update in its name as well, as previously it had been Bayside. This had always bugged me, as it turned out NOT to be on the bay as I had originally thought. The West Province began as the Kingdom of Westvale. It is an old kingdom, and the original home of both the Wizards and the Sages. The Wizards were driven away long ago, during a dark time known as the Mage-Hunts. The Sages are the wise men, keepers of knowledge in this world.